If you'd like to feel like a VIP player, see what's it like to be treated like a high roller, then Luxury Casino is a must online casino platform for you. WHY? : Licensed and regulated, great welcoming package for new players, wide variety of deposit & withdrawal methods, mobile friendly. United Kingdom players, as the casino holds an UKGC License and European players. If you’d like to feel like a VIP player, see what’s it like to be treated like a high roller, then Luxury Casino is a must online casino platform for you. The Luxury Casino has adopted a name signifying style and sophistication, with the brand first reaching the marketplace in 2000, when online casinos were still in their relative infancy. Many years and improvements have passed since the emergence of Luxury Casino. The current operation of Luxury Casino can be traced to Apollo Entertainment Limited, while the brand is also part of the Casino Rewards network. Ultimate ownership, meanwhile, can be attributed to a specialist iGaming company called Technology Services Trading limited. On the whole, Luxury Casino is one of the most technologically advanced brands to be on the Casino Rewards network. At the same time, it is also one of the most generous, as shall be discussed in more detail in the Luxury Casino review to follow. Deposit Methods: Abaqoos; ecoPayz; eCheck; eKonto; EntroPay; EPS; EUteller; eWire; Ezi-Pay; Fast Bank Transfer; Wire Transfer; flexEpin; iDebit; Instant Banking; Instadebit; GiroPay; Jeton; Kalibra; NETELLER; MultiBanco; Maestro; MasterCard; Moneta; Neosurf; Nordea; paysafecard; PayPal; Postepay; POLi; Przelewy24; Qiwi; Skrill; Swedbank; SOFORT; Ticket Premium; Trustly; uNet; uPayCard; VISA Electron; VISA. Withdrawal Methods: ecoPayz; eCheck; Ezi-Pay; EntroPay; Kalibra; NETELLER; PayPal; MasterCard; Maestro; Wire Transfer; Fast Bank Transfer; Postepay; Qiwi; uPayCard; VISA Electron; VISA; Skrill; Skrill 1-Tap. Restricted Countries: Afghanistan, Albania, Angola, Armenia, Australia, Azerbaijan, Belgium, Benin, Bhutan, Bosnia and Herzegovina, Burkina Faso, Burundi, Cape Verde, Central African Republic, Chad, Christmas Island, Cocos (Keeling) Island, Comoros, Congo, Cyprus, Dominica, East Timor, Singapore, Equatorial Guinea, Somalia, Eritrea, Malawi, South Africa, Ethiopia, Maldives, Spain, Mauritania, Sudan, Federated States of Micronesia, Mayotte, Syrian Arab Republic ,France, Myanmar, Taiwan, Guinea-Bissau, Nauru, Tajikistan, Guinea, Niger, Nigeria, Uganda, Hong Kong, Niue, United States , Hungary, Norfolk Island, North Korea (DPRK), Western Sahara, Iran, Netherlands, Iraq, Zaire, Italy, Pakistan, Zimbabwe, Ivory Coast, Palau, Ireland Peru, Portugal, Philippines, Romania, Rwanda. The historic approach of Luxury Casino was to provide Windows users with a gaming software package that could be installed to their PC or laptop. This approach has survived into the present, when the days of downloadable casinos are less common, but the strength is that players can have access to older games not available through instant-play. Instant-play is a concept available to HTML5 web browsers, including Chrome and Safari, and which enables users to access Luxury Casino without installing software. This is available on both desktop and mobile, with users in the latter camp afforded access whether they are on Apple iOS or Android devices. There used to be software limitations from Luxury Casino working only with Microgaming, but the software provider now has internal development studios in the form of Rabcat and Just for the Win. This is a key strength in making sure the casino site receives a stronger stream of newly released slots. Of course, the dream scenario would still be for Luxury Casino to enter into software deals with other providers. However, the presence of gaming content from Microgaming’s internal studios does provide relief in this area. Luxury Casino’s RTP is 96.25%. This was recorded over the span of 1 year. • Roulette: choose your preferred variant from European, American, or even French, with additional features including multi-wheel and multiplayer. • Blackjack: the blackjack tables are loaded with great features, such as multi-hand, single-deck, and double exposure. • Slots: the slot selection is led by the top titles of Deco Diamonds, Castle Builder 2, Girls with Guns, Game of Thrones, and Jurassic Park. 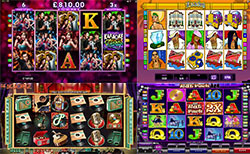 • Jackpots: play for progressive jackpots in the likes of Fruit Fiesta, Cash Splash, and the various Mega Moolah slots. Luxury Casino users have the ability to unlock perks through the externally operated Casino Rewards VIP scheme. New players shall start on level one and can rise up to six if they meet monthly requirements for earning status points through completing real-money wagers. The allure of making it to the higher levels is that players can ensure they receive enhanced rewards. In no particular order, these can include prize entries, tournament access, larger bonus offers, and the support of specialist VIP customer service personnel. Luxury Casino has made a serious commitment to supporting players, who get a range of communication options from which to choose. Live chat is available when signed in, while players can instead ask for a telephone call-back or else submit an email. Luxury Casino has provided answer to all manner of questions, so they are worth seeing for yourself. You can access Luxury Casino in more than 20 different languages if you install the Windows HD software available from the site’s homepage. Through instant-play, meanwhile, the options include English, German, French, and Danish. After signing in through the main site, Luxury Casino will then place you under the protection of secure sockets layer (SSL). This form of encryption is graded at 128-bit and is the reason why casino sites are able to stay secure and keep cyber criminals from gaining unwanted access. In addition any player registered through our links on Gambipedia.com will get direct assistance from us! If you run into any issue, problem or a general concern, drop a message: contact us. We work closely with the brands we promote and will help you either sort your problem out and/or get more information and details on what’s happening. The Luxury Casino sign up bonus will definitely be on the large side after you sign up and make your first deposit. On the table is a 100% first deposit bonus that will match your initial stake up to £150. You only need to deposit £10 if you want to enter at the lower end of the scale. Luxury Casino is set up so that you will need to download the site’s gaming software before you can create a new account. Thankfully, though, this can be completed in just a few minutes. The software is currently only compatible for Windows* users. *Mac users will be redirecting to a html5 casino, which means Mac users can play as well. Players from the UK and the wider world are permitted to register, as Luxury Casino has licences with the UK Gambling Commission and Malta Gaming Authority. The prospect of up to €/$/£1,000 worth of bonus funds makes the welcome package most appealing. Luxury Casino has compiled a long list of terms and conditions (T&Cs) that are important for players to view, but one of the key messages is that each of the bonus offers above are only claimable when players meet the minimum deposit level of €/$/£10 or greater. The T&Cs then delve into ever more detailed territory, where the wagering requirements are discussed in full. At a glance, you should know that the first bonus has to be played through 60 times, but that level goes down to 30 times for all subsequent bonus offers claimed.